Consumer habits are continuously evolving concurrently with the surroundings and not being able to adapt to the changes can result in being out of step with the consumers’ needs and wants and in the end lost market share. A global consumer insights survey conducted this year by PwC highlights some of the changes that are currently happening within the retail industry. Below, 3 of the major areas, in which consumer habits are changing, are listed and how you as a business will be able to respond to the changes. Although e-commerce generally has experienced growth over the years, currently amounting to a tenth of the sales within the retail industry on a global scale, it can be observed that especially mobile commerce has had an immense increase in popularity among consumers. In fact, purchases on mobile devices has more than doubled, over a period of six years, going from 7 % to 17 % according to the report from PwC, meaning that it is close to outperform the so-far most conventional device for online purchase – the personal computer – which has suffered a 7 % decline. 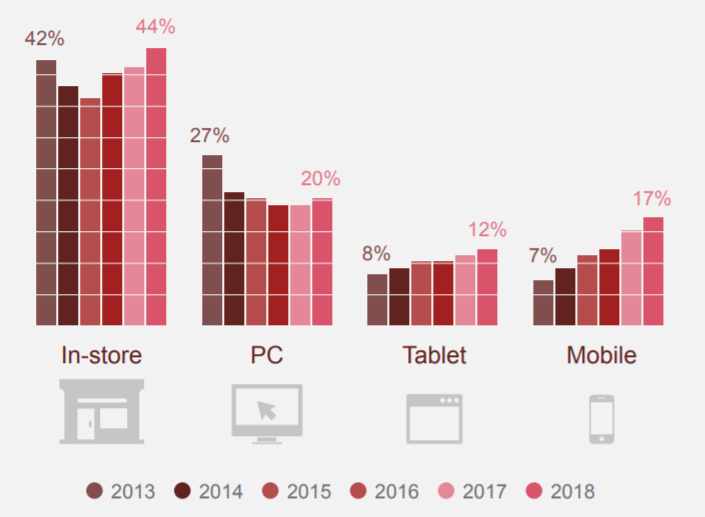 This seems to indicate that consumers have made a shift from shopping on their mobile devices rather than their PCs – making it critical for stores to meet the customers at their preferred channel. However, it is not only for online shopping mobile phones have proven their popularity. More and more consumers also use their mobile phones in-store to complete payments, which have been through both customized orders the customers have made in advance, in-store apps or mobile payment at checkout. In fact, the survey conducted by PwC shows that nearly half of the respondents prefer mobile payment in preference to the traditional payment methods. The rise in popularity of e-commerce means that online shopping has become an established part of consumers’ daily routines. Despite this, traditional shopping in physical stores has not become less desirable. In 2015, PwC’s survey showed that merely 36% of the respondents went shopping at bricks-and-mortar stores on a weekly basis, however, throughout the years physical shopping has made a comeback by rising to 44% in 2018. However, the reasons for consumers to shop regularly at physical stores may have changed. Offering the customer, the possibility of ordering online and pick up the product in-store contributes to the continued popularity. The last major consumer habit PwC’s survey showed was the fact that consumers are seeking to achieve a more personalized in-store experience. Instead of only using physical stores as a place to shop, consumers now seek to have a sensory and social experience. Businesses are able to meet the demands of the customers by integrating both mobile phones and artificial intelligence as a part of the shopping experience. It is crucial for businesses to respond to these changes in order to remain relevant in a fast-evolving industry affected by technological advances. Consumers want the opportunity to shop online, however, they also want to keep the physical stores. Fortunately, one thing does not exclude the other. Do you want to find out whether your technological platform is optimized to give the same experience both online and offline? Then download our e-book “This is how you navigate confidently through a changing market”, in which omnichannel is brought up for discussion.